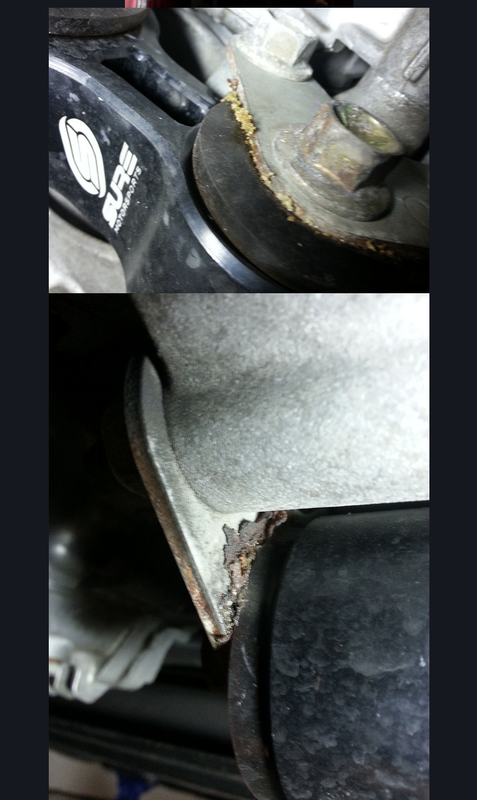 "Page 4 - SURE Motor Mount Bushing Issues"
"Next up.. SURE Rear Motor Mounts. Now, we cannot place blame on just SURE here. Several companies have had the urethane fail from their mounts. Most of the RMM on the market are rebuildable, so the companies just send out a replacement bushing and you are on your way." SURE Motorsports offers a lifetime warranty for the entire product line. Polyurethane bushings are wear components – through use, they will eventually need to be replaced. The SURE Motorsports lifetime warranty extends to all polyurethane components used in engine mount products. All SURE Motorsports engine mounts are rebuildable. "However... these have also affected the SURE Side Motormounts.."
In September, 2012, SURE Motorsports was alerted to the first occurrence of an issue with the Street Grade polyurethane compound. All affected customers were upgraded to Track Grade polyurethane at no charge. There have been no reported issues with SURE Motorsports Track Grade polyurethane bushings. In addition, SURE Motorsports engine mounts have had no reported issues outside of the polyurethane bushings. Under the SURE Motorsports lifetime warranty, SURE Motorsports will rebuild engine mounts with new polyurethane bushings in-house or ship new polyurethane bushings to affected customers free of charge. In 2014, SURE Motorsports introduced three classes of a new polyurethane compound. This new compound was designed to increase tensile strength, heat resistance, tear strength, longevity, and overall performance in the polyurethane. "You know, the ones that hold your engine in the car?" The SURE Motorsports S3 Driver Side Engine Mount features an inverted billet aluminum bushing housing with a horizontal polyurethane stress plane and bolt sleeve, eliminating the vertical bolt design that is prone to shearing in certain OEM factory engine mounts. There are no reports of the polyurethane in SURE Motorsports engine mounts causing the engine to drop to an unsafe level. A fatigued polyurethane engine mount bushing would create a noticeable increase in noise, vibration, and harshness for the driver, however the vehicle would remain drivable. "Why yes, we have begun to see lots of failures on the passenger side mount. SURE will gladly replace these with another mount, that will fail all over again." SURE Motorsports engine mounts have had no reported issues outside of the polyurethane bushings. "Do you know what happens if these mounts completely fail? All it takes is one passenger motor mount or transmission mount and you could be potentially killed, or kill innocent drivers or civilians. The engine will fall to either side of the engine bay, snapping the axle, causing you a catastrophic accident as the vehicle loses control." There have been no reported injuries, worldwide, resulting from the use of any SURE Motorsports product. Kevin Pugh's understanding of engine mount failure may be in reference to a recall issued by Mazda Motor Corporation (Mazda Recall No. 4607F) in July, 2007, for the OEM engine mount and vertical bolt. This recall has no relevance to any of the SURE Motorsports Engine Mounts. SURE Motorsports took this recall into account when designing the SURE Motorsports Driver Side (“transmission”) Engine Mount. SURE Motorsports issued a warranty notice for the polyurethane bushings of the Mazdaspeed 3 and Mazdaspeed 6 Passenger Side Engine Mounts that were purchased between May, 2012, and April, 2013. There are no warranty notices for any SURE Motorsports Driver Side (“transmission”) Engine Mounts. "But hey, these are isolated incidents according to SURE. Who do you want to believe here?" This issue was isolated to three specific Street Grade polyurethane bushings. These bushings were used in the Torq R3 Rear Engine Mount (December, 2010 - August, 2013), Torq R2/R6/R7 Rear Engine Mount (August, 2011 - November, 2013), Torq S3/S6 Passenger Engine Mount (May, 2012 - April, 2013). The SURE Motorsports Torq R3 Rear Engine Mount Street Grade polyurethane from December, 2010, to August, 2013, was prone to fatigue when used for aggressive driving or higher horsepower applications. The SURE Motorsports Torq R6/R7 Rear Engine Mount Street Grade polyurethane from August, 2011, to November, 2013, was prone to fatigue when used for aggressive driving or higher horsepower applications. SURE Motorsports has released three new classes of polyurethane, each designed to accommodate a different style of driving and address heat penetration concerns. SURE Motorsports offers a lifetime warranty for all engine mount products, including the polyurethane components of these products. Photos published by Kevin Pugh show the SURE Motorsports Torq R6 Rear Engine Mounts for the 2006-2007 Mazdaspeed 6. Affected customers who reported an issue with their Street Grade polyurethane bushings to SURE Motorsports were sent new polyurethane bushing replacements free of charge. 1. September 30, 2012: First reported issue. 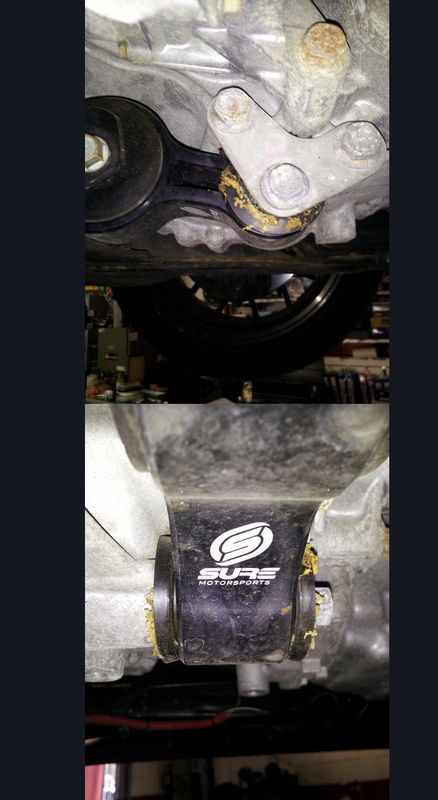 Customer contacted SURE Motorsports regarding his Torq R6 Rear Engine Mount that he purchased August 11, 2011. 2. October 1, 2012: Cullen Mariacher contacted the polyurethane material supplier regarding more information on the cause of the damage to the polyurethane. 3. October 1, 2012: SURE Motorsports began researching new polyurethane compounds. 4. October 25, 2012: SURE Motorsports received the damaged polyurethane back from customer. It was then shipped to the polyurethane supplier for analysis. 6. December, 2012: SURE Motorsports received analysis back from the polyurethane supplier. 7. February, 2013: SURE Motorsports determined that the polyurethane material supplier had not fulfilled product requirements and standards. SURE Motorsports transferred production to a new polyurethane material supplierin order to facilitate newly engineered polyurethane. "Side Mount - Terrible Quality Control:"
Kevin Pugh has no knowledge of SURE Motorsports quality control standards, SURE Motorsports internal procedures, or the design of the Torq S6 Engine Mount. Kevin Pugh mistakenly refers to the irregular profile of the engine mount bracket as "Terrible Quality Control" but in fact is properly designed for clearance reasons. The bracket profile is not an issue with "quality control." The bracket referenced is designed to fit the 2006-2007 Mazdaspeed 6. Below are photos taken at SURE Motorsports HQ of a the Mazdaspeed 6 Driver Side Engine Mount, for comparison to the photo of the same part published by Kevin Pugh. The parts are identical, as they should be. The Torq S6 driver side engine mount was designed specifically for the 2006 and 2007 Mazdaspeed 6. It is made of 6061-T6 CNC-machined aluminum with an anodized finish and laser-cut 304 stainless steel brackets with a brushed finish. The profile of the stainless steel bracket is designed properly, for design and clearance reasons, as shown in the photos above. SURE Motorsports quality control is overseen by four employees, at least three of which must approve each product before it is distributed. It is documented that the hole will round itself out as the bushing begins to fail. My only advice is to go back to your stock mounts or purchase mounts from JBR and cp-e. I am going to ask both cp-e and JBR to run a special on mounts to help with pricing for those whom have to remove their SURE mounts. Its unfortunate these are failing because they actually looked to be a solid product." Heat penetration into the previous polyurethane compound negatively affected the integrity of the polyurethane bushing. "Some owners have reported upgrading to SURE's race bushing helps the problem, however there are still reports that the actual mounts are coming in contact with other parts of the car, causing weird buzzing noises and added vibrations." SURE Motorsports upgraded affected customers to new polyurethane bushings in the class of their choice, free of charge.